For everyone unaware, Hollywood’s next big biblical epic is coming out next year. 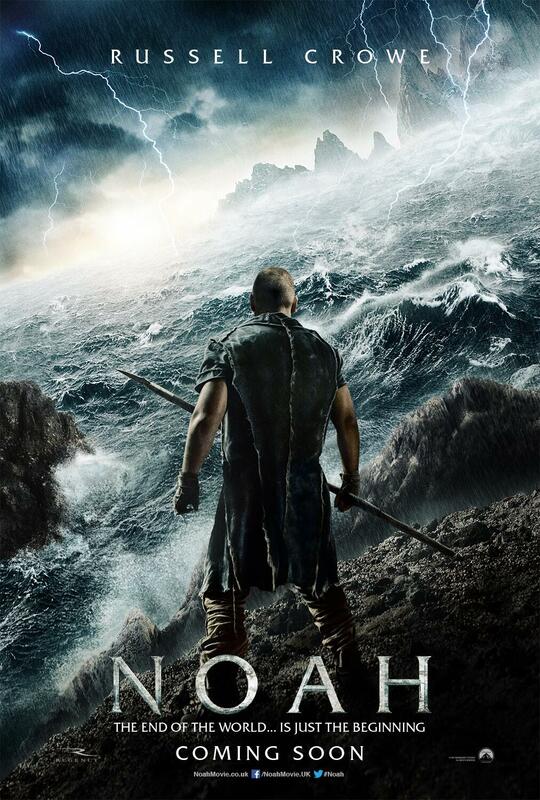 Darren Aronofsky (director of Black Swan and Requiem for a Dream) is set to release Noah in March 2014. With a star-studded cast, including Russell Crowe, Anthony Hopkins, Jennifer Connelly, and Emma Watson, this marks a return of the serious, big-budget films that explore the biblical stories for a new generation. I have loved the epic biblical movies of yesteryear, such as The Ten Commandments or Samson and Delilah, and more modern retellings, like The Bible miniseries, so this new film makes me very excited. If you haven’t checked out the trailer, you can see it here. Now, I have several issues with this writer’s challenge right from the start. The author claims that he has “various sources” who have given evidence that the film is not biblical. I am skeptical of such vague claims about the source of the plot points he attacks later. Without knowing who these people are, I have no way of knowing their intentions, or even their qualifications for judging the biblicalness of a film. Are they film critics, biblical scholars, or just a couple of crew from the film who are harbouring because Aronofsky took the last cucumber sandwich from craft services? I have no idea. Yet, for the sake of argument, we will continue as if the following claims are true. I have no idea what the inter-personal relationships are going to be like in the film, but I would bet quite a lot of money (if I was the gambling sort) that much of the dialogue is not going to be taken from the Bible. Before my conservative friends get upset, let’s have a look as to why. In the entire Flood story, from Genesis 6 – 9, only one person says anything at all: God. After Noah is told to build the ark, the Bible tells us “Noah did everything just as God commanded him.” (Gen. 6:22) God then gives Noah directions about which animals to bring on the Ark, and we are again told, “And Noah did all that the LORD commanded him. (Gen. 7:5) Not exactly riveting cinematic material. If Noah adds characters and interpersonal issues for dramatic reasons, we should not jump to the accusations of “unbiblical.” The artists are merely telling the story in a different way than the Bible has. We will return to this idea in my conclusion. The issue of Noah’s character, again founded on vague details like “Noah said essentially…” is also hard to build a strong case for. In Genesis, we are told that Noah was the only righteous man of his generation, but we are also told that he passes out, drunk and naked. The first words recorded of Noah’s are curses against his son. Definitely a person of complicated spiritual and emotional well-being. The author of this article seems to balk at the idea of a mentally strained Noah, but I believe there is evidence that the patriarch may have been affected by the ordeal. After a staggering list of unsupported claims about the plot and trivial detail differences, the author attacks the editors for the “con-job” they have pulled by stringing together enough of the film to make Christians and Jewish people willing to see the movie. This theory makes the filmmakers seem far more sinister than I think we can accuse them of being. Even if it turns out that this movie has very little in common with the biblical story, every trailer editor has the job of making the movie seem exciting and worthy of our fifteen or twenty bucks at the theatre. Of course they want us to be excited to see the film, because Noah needs to make money or else Aronofsky will have to stop making movies. Finally, our friend asks if we want our children and families to watch a movie that inaccurately portrays such a pivotal part of the Bible’s narrative. My answer is yes. I want my kids to know what the world is saying about our faith. Am I worried that they will be lured away from the true account into believing what Hollywood tells them about the Flood? No, because I am not leaving the spiritual education of my children to Hollywood. It is my job to instruct my kids in the truth of the faith. When they see this film, they will know how the Bible tells the story. This should be true for all Christians and Jewish people. If you are leaving your spiritual formation to big screen movies, you may need to start afresh. I don’t think a retelling of the Flood story is going to lead any away from God. As for those who do not know the story, I believe that this movie could be a huge blessing. After watching what appears to be an epic film with an incredible story, perhaps people will go “read the book.” I did that with The Hunger Games, so there is no reason to expect this situation to be any different. And anything that gets more people reading the Bible is good in my books. In the end, this is a question of the place of an artist in telling God’s story. Are we allowed to change details for dramatic effect? How important is the number of Noah’s sons for the Flood story? In the context of the Bible, you can argue that it is very important, for each son’s lineage is traced further in the book. Yet, in the Flood story, the important detail is that Noah and his family were saved by God for His purpose. The number of animals, the size of the boat, the opposition that the family faced are all secondary to the main idea: that God saves. If this is captured, then the story is told. Actually, my only qualm about this film so far is to be found on IMDB. Under genre, Noah is labeled as a fantasy. I understand that to a secular person this may be considered true, but to the faithful, this is a little insulting. But people are making good art about God. Perhaps this should be celebrated and not condemned. If we do that, maybe we will see more good art about the Creator in the future. Maybe. Now, having said all this, I have to admit that the author’s heart is in the right place. He is trying to discern Hollywood’s intent in making movies based on biblical stories. I just get frustrated when fellow Christians try to blockade any attempts at exploring our stories from different angles. If I come across as hard, I apologize. We both want the same thing: God to be glorified. As a lover of both cinematic and Biblical stories, I am honestly ashamed at the author of the blog you refute. Brandon, as you rightly point out, the Biblical material that is screenplay material is incredibly limited. A movie like this HAS to take some creative liberties! To say things like “Noah essentially says”, and “various [unnamed and therefore made up?] sources say…” are antagonizing, closed minded statements. He provides no references and no option for comments and discourse! Shouldn’t we at least provide some discussion and debate before he throws people right under the bus!? Ok, nit-picky writing details aside, our friend, as you refer to him, interestingly does not explicitly address a couple of controversial things rumoured about the film, and I’d be interested to hear your thoughts on them. How do you feel about the Aronofsky’s team taking liberties to create an entirely new “animal kingdom” that will be brought into the ark? I personally don’t find a problem with it, and that is why I believe they have labeled it a fantasy. Second, the movie is rumoured to have strong environmentalist undertones….as our friend does point out, it is less about relational story of redemption insomuch as visions about the destruction of the earth (a la Avatar-ian core themes). I have not seen a screening of the film so I can’t comment. Aronofsky is only “culturally Jewish”, according to wikipedia. How much weight would you put on a biblical story told cinematically who is merely a self-professed “cultural jew”? All in all, I am excited to see the film, and if anything I hope to bring my youth group to watch it as well. I hope that some of the inevitable differences and liberties taken can encourage dialogue, much like those in the Passion of the Christ did a number of years ago. As always, thanks for your insight on the matter! If this is true, we will need to readdress my defence, but I am withholding judgement until I can see it for myself. And even if this film portrays God in such a negative light, it can be an opportunity for conversation with belivers and unbelievers alike and does not need to be boycotted. Christians need to be known for what we believe in, not what we oppose. I am thrilled that Hollywood is FINALLY grasping that there is a huge following for Christian based movies and I do not think that “complete” accuracy is the most important issue right now! There is a bigger picture here! The main message is hope and salvation and I am so excited for the magnitude of people that will see this movie and the other movies listed in the article declaring 2014 the Year of the Bible! Can you imagine the ripple effect this could have…how many people go to movies…how many nonbelievers will see this? We are living in a time where people are desperate for answers and hope…a time where you are not freely open to discuss your Christian beliefs without negative feedback. Yet here we are, with some of the biggest names in Hollywood, putting it on the screen for all to see! How amazing is that! What if this is a person’s first glimpse into the stories of the bible? Whether they understand it as “truth” right now is not as important as them being inspired to begin seeking, opening their minds and hearts to the possibilities that these stories did, in fact, take place. Can you imagine what may follow? How many people might come to know Christ through these movies? Once they become aware, they can start questioning and search for the accurate details themselves. We are in a time of huge revival! I think as Christians we really need to pray about this and these movies…that they will breathe life into this book we call the Bible and bring souls to Christ in the thousands! I pray this is the start of something really BIG and I am so excited for the possibilities and all the people this industry has the power to reach!